NANFA and the Desert Springs Action Committee invites you to attend the 2010 NANFA Convention to be held at the amazing desert springs of Ash Meadows and other locations in southern Nevada. The deserts of North America provide a very exceptional setting to hold our convention. This harsh environment is hardly a place you would expect to find teeming with native fishes! But despite the contradictory term "desert fishes", if water is present, then fish can and will usually be found too! We hope that you will join us for what promises to be an interesting, educational, fun, and especially unique convention. And, if your family doesn't share your interest in desert springs and fishes, then leave them in Las Vegas while you watch pupfish swim in the sun. Here are links to two recent articles, the first on the Ash Meadows area, (a similar version also appeared in American Currents). The second is focused on the fishes and habitats we'll be visiting north of Las Vegas (this is from the upcoming American Currents). If you have Google Earth you can download a kml file that has placemarks for most of the localities mentioned below. Initially all activities will be conducted at the Ash Meadows National Wildlife Refuge (AMNWR) starting Thursday morning. Ash Meadows has in excess of 50 springs with most of them being small. Around a dozen larger springs are found in the valley floor which is home to the Ash Meadows Pupfish (Cyprinodon nevadensis mionectes) and Ash Meadows Speckled Dace (Rhinichthys osculus nevadensis). A group of small springs known as the Warm Springs Area contains another pupfish subspecies, Warm Springs Pupfish (Cyprinodon nevadensis pectoralis). In Ash Meadows we will be working on various projects to assist staff at the AMNWR with their conservation efforts. There will be a variety of activities for people to be involved with including trapping and removing exotic fishes, crayfishes and bullfrogs, and removing cattails from spring pools and channels. There will also be ample opportunity to tour around the wildlife refuge to see the various springs (click here for a map of the refuge), their inhabitants and to learn about the wonderful world of Ash Meadows. Folks will also be able to visit Devils Hole which is the home of Cyprinodon diabolis or Devils Hole Pupfish, one the worlds most restricted vertebrate species. It is also extremely endangered too, with only a tiny population of less than 200 individuals! There will also be plenty of time to see other species of pupfishes, (Cyprinodon nevadensis mionectes, C. n. pectoralis) and Ash Meadows Speckled Dace (Rhinichthys osculus nevadensis) up close in their natural habitats. You will be amazed and enchanted by the brilliant blue male pupfish that gallantly stake out a territory and try to attract and convince prospective females to check them out. Most people will fly into Las Vegas. From there Ash Meadows is around a 2 hour drive. Most folks will stay at the Longstreet Inn and Casino which is approximately 6 miles from the AMNWR headquarters (we will be contacting them about convention rates). There will also be limited camping available behind the refuge headquarters (which is not usually permitted for the general public). Many folks will likely need to rent a car. We hope to be able to help folks coordinate this so that costs can be shared to the maximum extent, so if you need help with finding folks to share with jump onto the NANFA Forum or contact Peter Unmack at and I will try and put folks in touch with each other. If sufficient demand exists we may try and facilitate an airport pickup or drop-off, but it will be difficult to get around without a vehicle. Saturday morning we'll drive an hour to the visitors center at the headquarters of Death Valley National Park. We have several regional authorities on fishes set to provide entertaining presentations on native desert fishes from their respective regions. Our current speaker list includes: Steve Parmenter who is a biologist with California Fish and Game and is in charge of managing native fishes in the Owens Valley in eastern California; Jon Sjoberg who is a biologist with Nevada Division of Wildlife and the head of their southern region fisheries and aquatic species programs; Kevin Wilson and Bailey Gaines work for the US National Parks Service, they are responsible for anything and everything related to the Devils Hole Pupfish; David Ward who works with Arizona Game and Fish and is responsible for breeding various small and large native fishes at their Bubbling Springs research facility. As additional speakers are confirmed we will add them to this list. Lunch will be at Salt Creek, an amazing pupfish habitat on the floor of Death Valley a few miles from the visitors center. Here we will observe the Salt Creek pupfish (Cyprinodon salinus). On the drive back to Ash Meadows folks should have time to visit various sites in the park in the vicinity of Furnace Creek including Badwater, the lowest, driest and hottest point in North America (134 F is the record), Zabriskie Point and the incredible Dante's View where you stand at 5,500 feet, look down to -282 feet (Badwater), then up to 11,000 feet (Telescope Peak). We also plan to have an open discussion regarding the possibilities of a partnership between regulatory agencies in the west and skilled aquarists who can help fill in the gaps of our knowledge relative to the breeding biology of the various desert fishes that are poorly understood. Hopefully by having both agency biologists and aquarists in the same room we can develop a better understanding of the expectations of each other, and to also discuss the difficulties that exist and how they might be overcome. Map showing the approximate locations of most places we'll visit. For finer detail download the kml file that has placemarks for all these places and more that can be loaded into Google Earth. The regular NANFA convention will officially end in Ash Meadows on Sunday at lunch time. For those looking for an extended desert fishes experience we will lead folks to visit various fish habitats near and north of Las Vegas for two and a half days. Depending on time and interest this schedule remains flexible, other locations can be included, thus treat this as an approximate schedule. 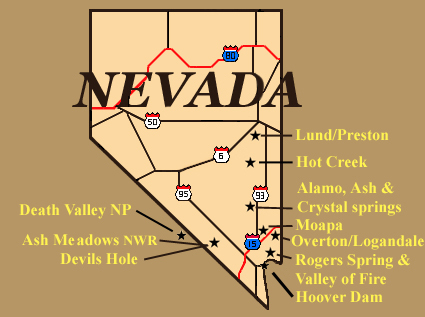 From Ash Meadows we will head back through Las Vegas to visit Rogers Spring by Lake Mead. This spring is best known for its crazy populations of aquarium fishes, typically Mollies, Convict Cichlid, Texas Cichlid and whatever else has recently been introduced can be found. It is also an excellent place to snorkel with water around 85 F. There will also potentially be time for folks to visit Hoover Dam (and see the new amazing bridge being built over the Colorado River) as well as Valley of Fire State Park. We will stay in Overton/Logandale Sunday evening (around 1.25 hours from Las Vegas airport). Monday morning we will head up the Moapa River to visit the Moapa National Wildlife Refuge to see the endemic Moapa Dace (Moapa coriacea) and Moapa Springfish (Crenichthys baileyi moapae). From here we will head north to Ash and Crystal springs (88 and 81 F respectively) just north of Alamo. These are both very large springs which are ideal for snorkeling. Springfish are a delight to see with their bright yellow coloration contrasted against the green algae spread across the substrate. We will spend the night in Alamo (1.75 hours from Las Vegas airport). Tuesday we will head north to visit Hot Creek, a great place to view and snorkel with Morman Springfish (Crenichthys baileyi thermophilus) in water that is 93 F at the spring source. From here we'll head north to Lund and Preston to see some smaller springs with Preston Springfish (Crenichthys baileyi albivallis) and Speckled Dace (Rhinichthys osculus). Preston will mark the complete end of the extended NANFA convention. 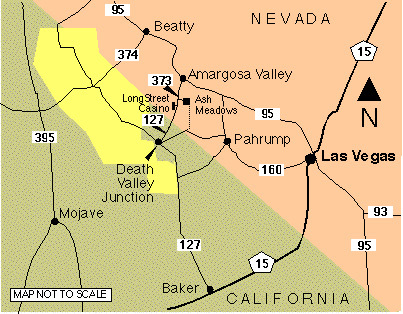 After Preston folks can either stay at a local hotel, or drive part or all of the way back to Las Vegas. From Preston to the airport it is a 4 hour drive. Registration cost is $100.00 (for members, $120 for non-members, add $40 for your spouse), which is a little bit higher than normal as we'll be including 4 breakfasts, 3 lunches, 1 dinner as well as drinks and snacks (alternative proximate eating options aren't really available). Late registration (after September 12) will be $10.00 more, so be sure to reserve early! Student registration is $85.00. Use the paypal link below or send a check payable to NANFA to: NANFA, P.O. Box 1596, Milton WA 98354-1596. We recommend that attendees stay at the Longstreet Casino and Inn. We have a block of rooms booked. Rooms have two queen beds for $40 per night for two people, extra people are $6 each plus there is a 7.1% tax. Call the hotel at 775-372-1777 and give them this confirmation code, 68535. There are also very limited opportunities to camp behind the refuge headquarters in Ash Meadows. Please contact Peter Unmack if you are thinking of doing this though. The weather in this region in October is usually quite pleasant. The average high in Las Vegas is 82, the low is 54. If an early strong storm front moves through then conditions can be cooler and quite windy. It is extremely unlikely to rain. Sunscreen, hat, water bottle (we will have drinks available, but it is easy to dehydrate out here), warmer evening cloths, wind breaker, shorts, towel to dry off after snorkeling, face mask, snorkel, (leave the wet suit behind), and a big smile. The current plan is to provide lunches Thursday, Friday and Saturday in the form of MREs (military meals read to eat) and sandwich fixings on alternative days. We intend to provide semi-self served breakfasts Thur-Sat at the AMNWR headquarters (cereal, toast, pancakes, eggs, etc). We also plan to have a bbq dinner Friday evening at the AMNWR headquarters. You will need to provide yourself with dinner each day except Friday. The Longstreet Casino has a reasonable restaurant or you can prepare something yourself at the AMNWR headquarters. It is important to keep in mind that most native desert fishes are specifically protected by state and federal laws, as such none can be removed or taken home. There will be ample opportunities to see and handle these unique desert native fishes which is unavailable to the general public otherwise, but there will be no independent collecting as per previous NANFA conventions. 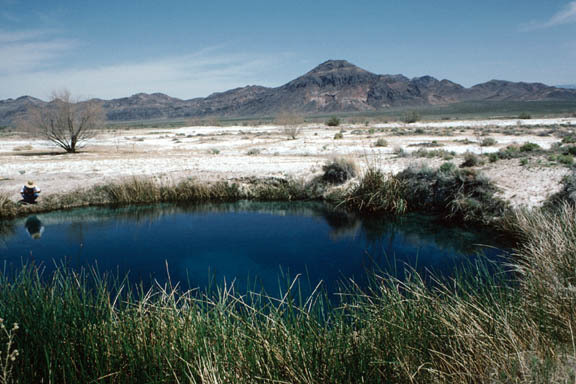 Also, there is no swimming or snorkeling in Ash Meadows either, but we will be able to do this elsewhere. Desert Springs Action Committee www.pupfish.net/dsac click on desert habitats for more information on Ash Meadows. To see a listing of everything on the DSAC site click on site map.